We cooked this while camping in the Dordogne where duck is plentiful and you can buy fabulous fresh walnuts in all the local markets. What a treat! Wine Suggestion: we can suggest a glass of the walnut liqueur “Liqueur de Noix” for dessert. The Tante Mïon we found from Sarlat was definitely artisanale, but had great character and smoothness. A holiday treat. Score the duck skin with a sharp knife, then rub all over with sea salt and black pepper. Place the duck breasts skin side down in a large non-stick frying pan on a medium-high heat. Sear for 6 minutes or until the skin is dark golden, then turn over and cook for another 5 minutes (or longer if that’s your preference). Remove to a board to rest but leave the pan on the heat. Slice 10 thin slices of baguette. Put the slices of bread into the hot pan with the walnuts and toast in the duck fat until golden, then remove and arrange the toasts on a serving plate. Meanwhile, top and tail the oranges, cut away the peal, then slice finely into rounds (remove any pips as you go). Finely slice the duck and put the slices on top of the little toasts. Scatter any extra duck and the oranges around, then dress the watercress with any resting juices on the board and sprinkle over. Scatter over the toasted walnuts, season, and serve. This is such a clever idea, especially if you don’t have one of those fancy things for cooking fish on the barbecue. The fish doesn’t stick to the grill but you still get all the smoky barbecue flavours plus a delicious spike of citrus. The idea has us thinking of other combinations and we loved the caramelisation that happened to the oranges which gives the dish an extra dimension. Wine Suggestion: This cries out for a Spanish white, like Albarino or Godello, where the best examples balance a depth of texture with a lightness of being. We drank a Dominio de Tares Godello from Bierzo which was amazing on its own and then with the fish. Perfectly matched. Finely grate the zest of the 1 of the oranges and add to the lemon zest. Mix with the olive oil, then drizzle over the fish and season. Cut the rest of the oranges into slices, about ½ cm thick. 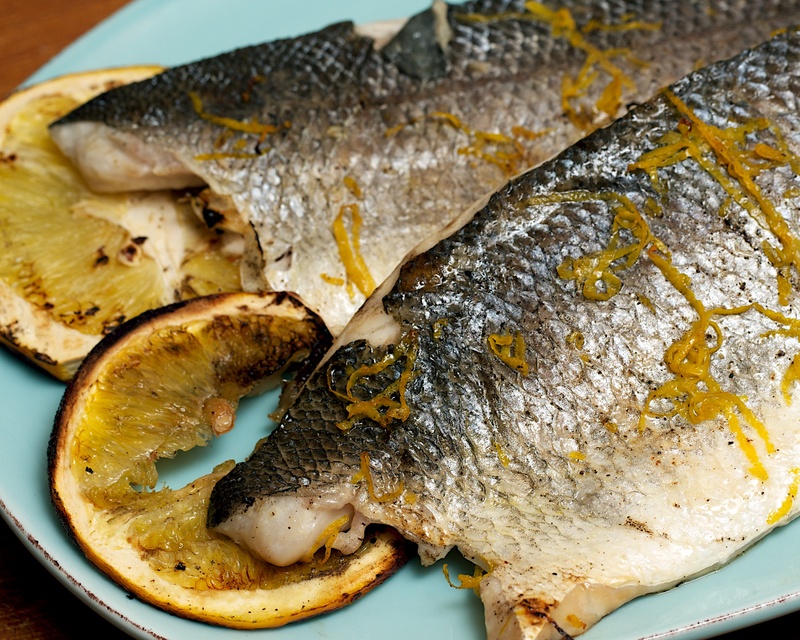 Arrange the orange slices over the barbecue grill, close together so you can lay the fish on top. Barbecue the fish for 5-8 minutes on each side, or until the flesh flakes easily. To make the salad: Put the orange segments into a large bowl, with the squeezed juice from the rest of the oranges and the lemon juice. Season and stir in the olive oil. Toss the watercress in the orange dressing with the capers and the olives. Serve the fish with the salad.